Fresh Mussels, a super treat smothered in a tasty sauce, mopped up with delicious home baked bread. Quick and easy to prepare, follow these simple steps and you’ll be preparing Moules Marinieres for you next dinner party like a pro. Fresh Mussels must be tightly closed. If they’re gaping, tap lightly and leave for 5 minutes. If they close, great, use them – if not, they are either old or dead so discard. Check that the shells are not broken or cracked. When you’re gathering wild Mussels allow them to rest in a bucket of fresh water for an hour to expel any excess sand. Thankfully, cultivated mussels are not sandy. To clean the beard from the Mussels, I run a small vegetable knife down the flat side of the Mussel and cut through the beard while tugging gently. Scrub the shell with a “food only” scrubbing brush. Steam Mussels until they open, about 3 minutes. 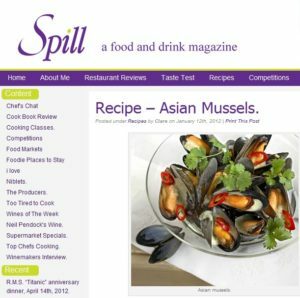 I still discard Mussels that do not open during cooking but have read it’s unnecessary. Check out http://www.abc.net.au/science/articles/2008/10/29/2404364.htm and decide for yourself. Raw Mussels can be stored in the fridge for 48 – 72 hours. Store in a colander placed in a bowl to collect any liquid. Never store in a sealed bag or submerged in water as they will die. If freezing Mussels it’s best to first cook them and then freeze. If you’re planning on gathering wild Mussels please check with the department of Agriculture, Forestry and Fisheries: 021 4307013/4/5/6/7/8 or 021 4307007 before 3.30pm. To be honest, I battled to get hold of anyone at these numbers – but the Hotline number advertised on the net is never answered, so you’ll have to be persistent. Cultivated Mussels are checked regularly and will be fine as long as they come from a trusted supplier. Mussels are filter feeders, meaning they feed on nutrients found in the water and do not rely on wild caught fish for food. They are therefore farmed very successfully, are a highly sustainable source of seafood and on the SASSI green list. Wild Mussels can only be harvested by recreational and subsistence fishermen with the correct permits and are limited to 30 per person per day. 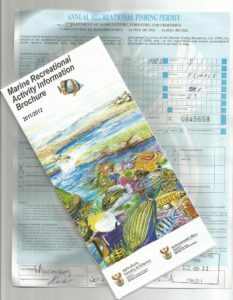 To collect wild Mussels you must be in possession of a permit, which can be bought from your local post office for R94.00. The permit allows you to collect 30 per person per day. Be sure to get the information booklet as well and take note of the areas in which you’re allowed to collect as a lot of our coastline is protected. I discovered from the brochure that one may only collect during sunrise and sunset. I’ve collected 5 different recipes to share with you from some of our local Mussel lovers. Mussels with beer and Chorizo, Richard Bosman quality cured meat.